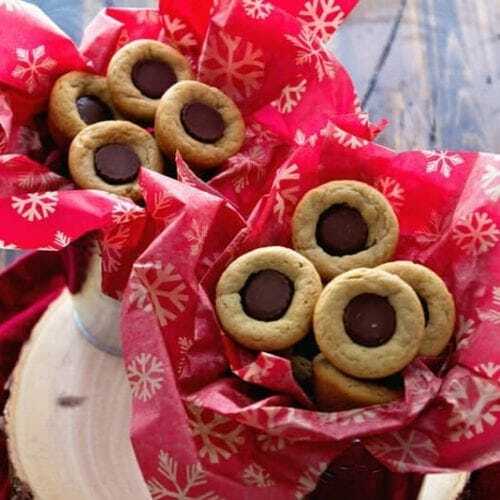 Peanut Butter Cup Cookies ~ Soft, Chewy Peanut Butter Cookies Made in a Mini Muffin Tin and Filled with Reese’s Peanut Butter Cups! I started looking at the calendar and realized that after these three weeks of Christmas mayhem this baby is going to be here before I know it! So, on top of trying to bake Christmas treats I decided I should probably knock out some extra recipes for my “maternity” leave from the blog. 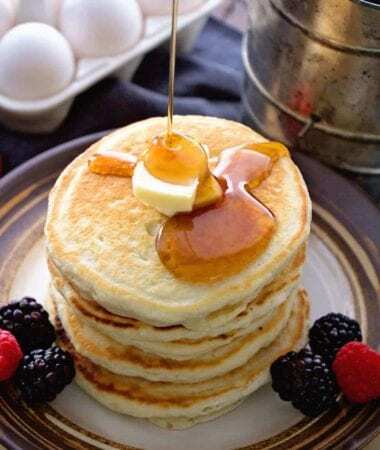 I do my best to make sure that the blog keeps on going even though I plan on taking at least a month off from making any type of recipe for the blog! If I’m honest, I’ll be shooting for two but we will see if that happens. I might not have my act together quite that much! After making four recipes for the blog and two batches of Christmas cookies my feet are aching. I’m guessing the whole being seven months pregnant isn’t helping out at all! I really want to quit typing and just head to bed but I suppose that would be a bad idea considering I’d leave you with out these delicious cookies and amazing giveaway. 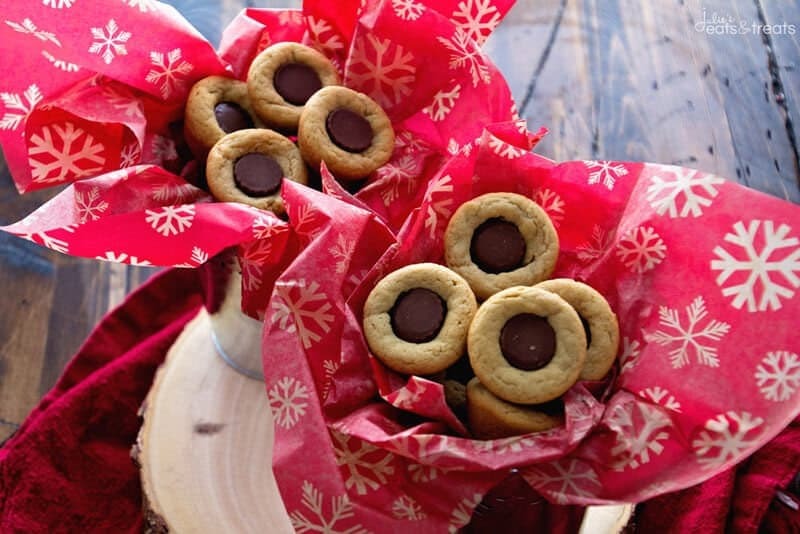 We love our version of Peanut Butter Blossoms, aka sub a rolo on top to twist things up. There’s something about that chewy peanut butter cookie and chocolate. 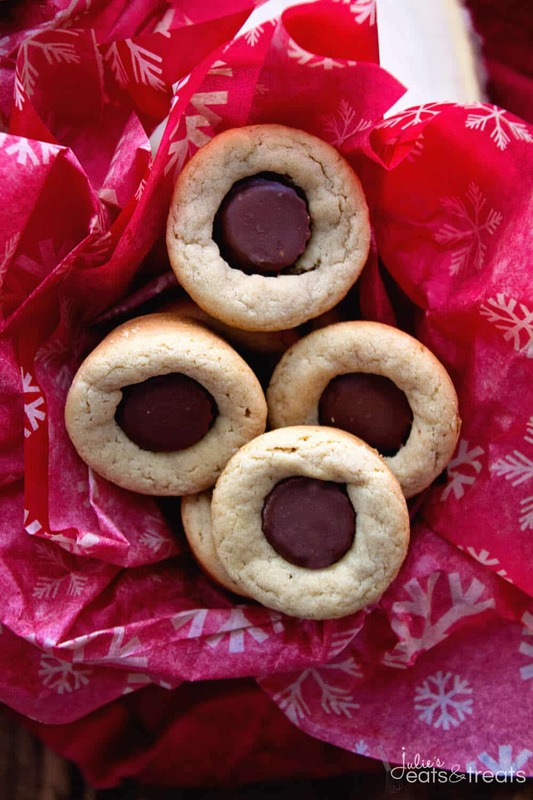 That’s why I knew we’d love these Peanut Butter Cup Cookies! I don’t think I met any combo of peanut butter and chocolate that I didn’t love. These are no different. Soft chewy peanut butter cookie dough in a mini muffin tin, baked for a few minutes then add a Reese’s Peanut Butter Cup to have perfection! 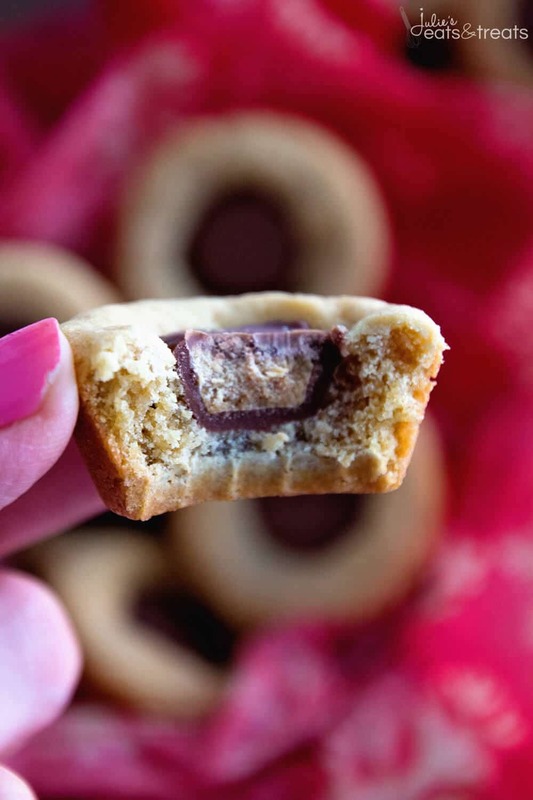 Soft, Chewy Peanut Butter Cookies Made in a Mini Muffin Tin and Filled with Reese's Peanut Butter Cups! In a medium sized bowl whisk together the flour, salt and baking soda. In a different mixing bowl cream together the butter, sugar, peanut butter and brown sugar until fluffy. Beat in the egg, vanilla and milk. Add the flour mixture; mix well. Shape into 1 inch balls and place each into a greased mini muffin pan. Bake at 375 degrees for about 8-10 minutes. Remove from oven and immediately press a mini peanut butter cup into each ball. Cool and carefully remove from pan. 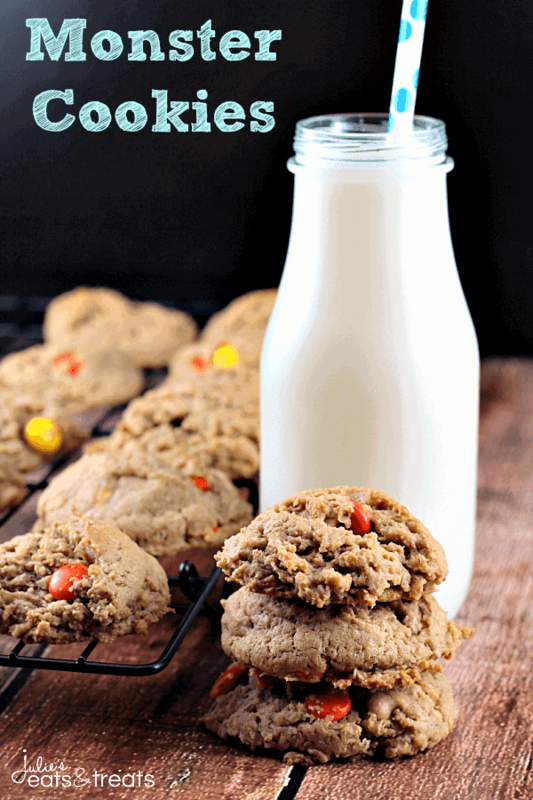 Reese’s Pieces Peanut Butter Cookies ~ Perfectly soft, chewy and delicious! Loaded with peanut butter chips & Reese’s Pieces! I want to shut from the rooftops that’s how amazing these cookies are! I love these cookies and ate them growing up!! Love the idea of using a rolo! 7 months already, time has flown!! It’s exciting your little one will be here soon!! at seven months I was watching everyone doing the baking because I was huge carrying a 10lb.baby. The recipe looks delicious and if I wasn’t Diabetic I would be eating them now. If I am not in Hospital with my heart surgery just before Christmas I will make them for my grandchildren. Thanks for all you do for us. Merry Christmas. Now go and put your feet up. These looks amazing, thank you for sharing, never had a Kitchen aid mixer (too expensive) would be awesome to win one ? Merry Christmas ? I love anything peanut butter. Adding chocolate to the peanut butter makes it even better! There are no entries awarded for Facebook likes…remember FB changed that a couple years ago when they took away “like-gating” for pages? So they give you the option to do it but you don’t get any entries for it. I appreciate your response. I knew from FB activities that a sponsor couldn’t require a like, but I guess I was expecting that number to change. It’s funny, I’d probably like/follow/subscribe regardless. Thanks again. Hope you have a wonderful holiday season. Well, I’m not sure that’s exactly what happened, Julie–but I don’t think I got any entries for those actions. On Facebook, a sponsor can’t require you to like their page in order to enter a giveaway. As far as I know, bloggers can set up their giveaways however they want. I just didn’t know if I did something wrong; and, I had been having lots of trouble with my computer–so I wondered if something malfunctioned. I already “Liked” you; I just wanted to increase my chance of winning. Thanks for the great giveaway. Hope you enjoy a blessed holiday season. I really want to try making some pecan butter if I win. i also have an entry question. It shows 10 confirmed entries, but only 5 is showing at the top. What does that mean? First, I would make my great grandma’s German chocolate banana cake. I want these cookies! 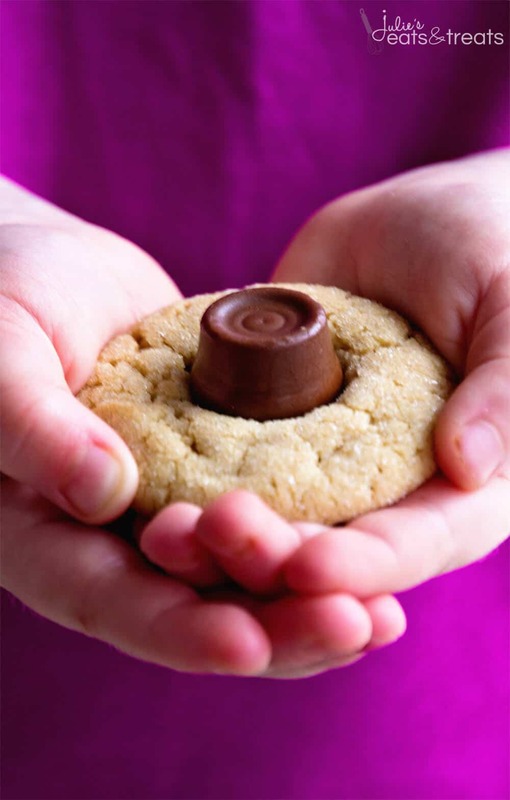 It’s all of the best things in one chewy cookie. YUM!